Look, I know in the comics that Vision has purged his emotions multiple times, but that’s no excuse to turn an innocent Mr. Potato Head into the creepiest thing imaginable. PPW Toys have been doing Mr. Potato Heads based on pop culture characters for ages now—but their rebrand into “Poptaters” has allowed them to delve even further into worlds like Star Wars and Marvel, as is the case with these new Potato Heads. 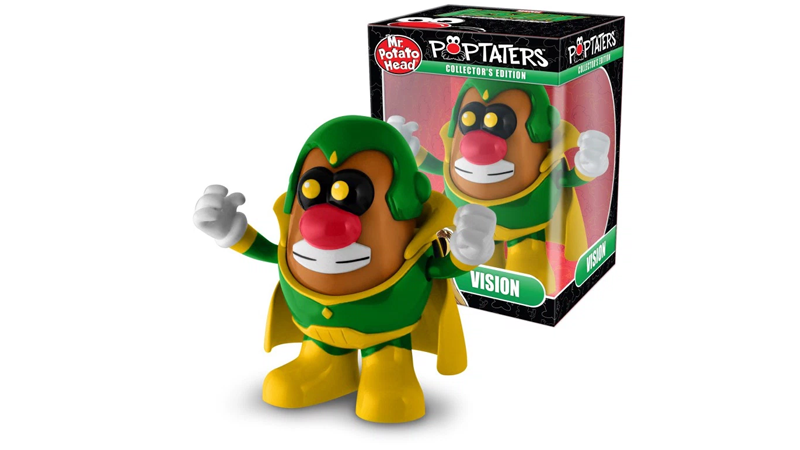 Joining the recently unveiled Star-Lord and Groot Potatoes are two characters who have appeared in Marvel’s Cinematic Universe recently, Daredevil and Vision, however for some reason they’re in their comic book looks here rather than their movie (and in the case of Daredevil, Netflix) costumes. Daredevil looks pretty nifty, and the attempt to cover his eyes with the red ones of the mask isn’t perfect, but it works. Vision on the other hand... yes, it’s more faithful to the character to do the black-and-yellow eyes, especially if you’re putting him in his classic costume. But on a Mr. Potato Head, with its giant eyeballs? It’s goddamn PETRIFYING. Potato Vision bores into your very soul, so cold and so still. Silently judging you. Watching you. Waiting for the right moment to enact android/potato justice. The Daredevil and Vision Potato Heads will set you back around $20 each when they release soon.